A new way to really get rid of your grief for good has been discovered. You can get the app in the app store for your phone or tablet (very soon if the app store links aren’t here or active yet) or you can use the version that’s right on this web page. This unique app is designed to allow you to guide yourself through a series of audio instructions for doing the Pure Awareness Techniques. The Pure Awareness Techniques are a new technology for powerfully and permanently resolving grief and other emotional problems. Each technique has it’s own series of audio instructions. In order to have the audio instructions play smoothly without interruption the software is set to download the full sequence of audio clips when you click on the DOWNLOAD button. When someone you are close to dies you feel a deep sense of loss. For most people this is a very painful experience. One of the first times I helped someone resolve the pain of grief was with a woman in New Zealand. She as attending a 2-day seminar to learn the basic skills of IGO and near the end of the 2nd day she asked if the techniques could be used to help resolve grief. As she said this she started to cry. I said to her that I was sure she had cried over this issue many times but that wasn’t resolving the pain of the grief. How about we try something new? She nodded in agreement through her tears. So the first step was to help her come out of the crying. I explained to her that there’s a new way of dealing with the crying that works much better. Instead of just collapsing into painful energy and being swept away into crying try putting you focus of attention right into the center of the strongest area of the painful sensation that’s making you cry. I know it might sound a bit crazy to do that but… it works. And it did. She stopped crying immediately and a calmness came over her face. Then I guided her through the IN Technique to resolve the pain of the grief. It took about half an hour. When the first area of pain was gone she became aware of a 2nd area of pain. I guided her through the IN Technique again to resolve this 2nd area of pain. When all of the pain was gone, I asked her to think of the situation again and see if there was any remaining pain of grief. She sat quietly for a few moments and then said… All the pain is gone. She smiled. All this time I didn’t know what she was grieving about because she had started crying before saying anything about that. It is interesting to note that I didn’t have to know anything about that in order to help her resolve the pain. This is because with Inner Greatness Optimizing we are dealing with the energy of the emotion not the content. So I asked her if she would be OK with sharing what it was she had been grieving about with the class. She said yes, that she could do that. She said that 15 years before she had been driving her car and had a terrible accident. Her 3 year old daughter who was in the car died in the accident. She had been feeling the pain of this loss all of these 15 years and hadn’t been able to get over it. She was a social worker and was aware of a wide range of healing modalities. She had tried everything she could find but nothing had worked. She said, now this is the first time that she could think of what happened and not feel any pain. In fact, she said, all I could feel was the love for my daughter! This is not an isolated case. There have been many, many cases like this and the technique has always worked to resolve the pain of grief with only one exception where the woman had just had her husband die in her arms right after getting married. She was so distraught that she just couldn’t do the technique then. Pretty much everyone in the world is not good at resolving emotional pain, especially the pain of the loss of a loved one. Researchers on grief say that mourning for two or three years is not unusual, and as in the case mentioned above, in some people the grief can linger for many years. So the general understanding of how long it takes to grieve a loss is based primarily on just the observation of it indeed taking a long time for most people to appear to recover from it. This isn’t because it is intrinsically difficult to get over the pain of grief. It is due to people’s low levels of emotional competence. They simply don’t know how to do it and they are deeply conditioned to resist feeling things fully. So the norm is to avoid feeling the pain of the loss and do their best to suppress the pain which unfortunately just… keeps it. So You Think You Are Over It? At one seminar that I gave in London a participant said that her mom had died about 6 months before but that she was over it. I asked her to tell me a little bit about her mom and as she did she started to cry. So again I guided her through the use of the IN Technique to resolve the grief and in about 15 to 20 minutes the pain was gone. Now she could talk about her mom without crying. In fact, again, all she could feel when she thought about and talked about her mom was her love for her. All the pain was gone now. People are so used to suppressing their emotional pain that they don’t realize they are doing it. In this woman’s case she thought she was over the grief but it didn’t take much to find out that this wasn’t really true. The pain was still there right below the surface. After using the IN Technique the pain really was gone… completely! If you go by the normal observation that it does take most people a long time to get over their grief (and some people never really get over it) It’s good to have a new perspective that it really isn’t as difficult as one would think. Based on this background of people’s past experiences of it being difficult and taking a long time you would be making your assessment without the benefit of having a new technology for resolving grief. Now with what you can learn from this app it can be resolved in less than an hour or two at the most. I’ve helped many people resolve their grief and it’s never taken longer than a couple of hours maximum. Sometimes it take less than half an hour. I’ve heard people say that they feel that if they stop grieving that others will think that they didn’t really love the person they lost. The length of time it takes you to get over grieving your loss doesn’t have anything to do with the degree to which you love or loved that person. Do you think that they would want to see you continuing to be in pain for a long time? Of course not. And in fact, when you resolve the stress energy patterns of the pain of loss the most common experience that people report is that now they can really feel their love for the person much better when it isn’t clouded by the pain. Have the Courage to Just Try It! But you do have to at least have the courage to try it and not just give up the moment that you start to get in touch with the pain of your loss because the emotional energy feels intense. There’s no question that it will feel intense. It will. But even though it will feel intense, you can quickly learn how to handle “intense”. And the way to handle it is to do exactly the same as described above for crying. When you focus on the central strongest area of the emotional pain, what you will find is that it’s just a sensation. One additional thing you can do to make it even easier is to adjust how close to or far away from the pain you are with your awareness. Most people don’t know that you can adjust how close to or far away from the sensation of the pain you are. Generally people just get as far away from it as possible or collapse into it and cry. If you are too close to it and it still feels overwhelming back up a little bit. Take your attention away from the sensation a bit. That’s kind of like getting in a helicopter and going up in the air away from the pain. Adjust the distance so that you can still feel the energy but that you’re not so close that it is overwhelming. It just takes a little practice but you can rapidly get the feel for it. But also remember that the key to success with this is to keep the focus of your attention right into the center of the strongest area of the pain. You may have a pretty deep habit of collapsing into crying so you might have to refocus on the central strongest area of the pain repeatedly in order to keep from collapsing back into crying. It may take a little practice to get this part. If images or sounds or other kinds of memories from thinking about your loss start to grip your attention, that’s similar to collapsing into the crying. Instead of letting that happen, you refocus your attention on the “sensation”, on the “energy” of the pain and you focus right into the center of the strongest part of it. This will help you to not get lost to the images and memories. You are about to learn how to resolve your grief. This is going to take learning to do some things that are the exact opposite of what you have been doing your whole life but it turns out to be pretty easy. You’ve been suppressing the pain that’s at the basis of your grief. You may still be angry or upset at what happened. These patterns of conditioning keep you locked into having painful feelings and you may be having some trouble really resolving them. This usually means that you will have mainly what we called Painful/Internal emotional energy patterns still held in your body. 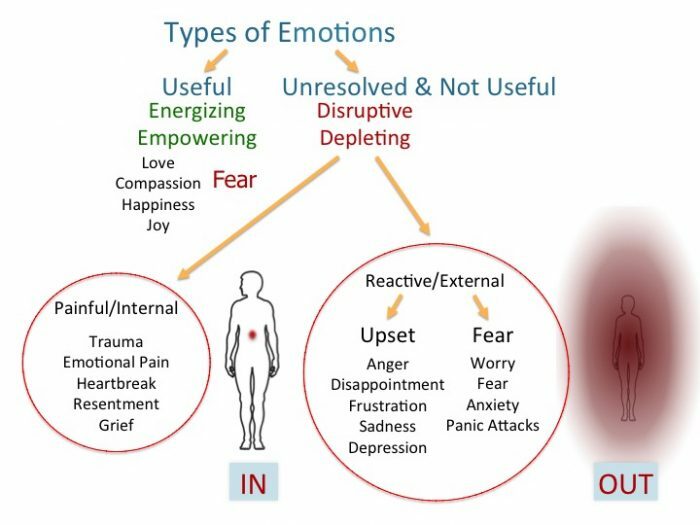 Here’s a diagram of the different kinds of disruptive emotional energies. The key to being able to breakthrough and finally get rid of your grief is to approach it on a new level… on the level where it really lives. The content is the part that most people and most attempts to resolve it focus on. But it is the energy of the emotion that gives it life. When the energy is gone, the emotion is gone. The circumstances may still be there but the “charge” of your emotional reaction to the circumstances will be gone. It becomes neutral. The new approach that you are going to learn from this app is how to effectively resolve the disruptive emotional energy that IS what your grief is made of. It is literally like running anti-virus software on yourself! It is going to wipe it off of your hard drive!!! You’re going to learn how to allow yourself to feel the energy of your old unresolved emotional pain of your grief in a new way. This is something new that you haven’t known how to do in the past. Once you learn how to locate the emotional energy, you’ll learn how to put your attention right into the center of the most intense part of the energy field of the emotional pain and how to completely resolve it. Strangely enough, this simple shift to focusing on the strongest area of the sensation of the residual energy field and staying focused there is the main new thing you have to learn how to do. And it isn’t that hard to do it. The strongest area of the energy field is usually right in the center of the field. What will happen when you focus on the strongest area of the pain is that it will initially feel stronger than normal because you are really allowing yourself to feel it more than you normally do. And the intensity level may seem to stay more or less the same for awhile. But as you just innocently continue to notice the strongest area of the energy of the pain it will gradually start to soften and become less intense. When it does, bring your awareness closer to whatever remains of the energy. Again focus on the strongest area. Each time it softens get closer to it. You are used to avoiding feeling this pain. This habit of avoidance comes from a deep form of conditioning that occurs in early childhood. You get emotionally overwhelmed a lot as a kid. And nobody likes it. In fact, we hate it. And we make a “pre-verbal decision” to do our best to NOT feel painful, overwhelming feelings. We learn to immediately suppress our feelings. But suppression and completion of the experience of the left over emotional energies of traumatic experiences are completely different. Suppression keeps the emotional energy in your body. Completing it with the technique you are about to learn allows the body to finally let it go and then it’s really gone… for good! If you have more than one person who you are still feeling grief about losing, you can do a variation of the provocation test of simply thinking of the other person you are grieving for and see if there’s any pain left when thinking of them. It also works for anything you feel a sense of loss about, a pet, a business or anything. If you have any pain over anything like this then shift to the IN Technique and resolve that too. You can resolve as many grief energies as you feel comfortable to do in one sitting. That’s entirely up to you and of course how many of them you have. The REPLAY button only plays the last instruction that you just previously heard. You can play it again if you need to but it doesn’t step back through the other previous instructions. To hear the early ones again you have to start over using the link for that at the top of the page. To get started you first have to feel the energy field of the emotion. For grief it is usually not difficult to do that. As soon as you feel the pain click on the START button. When you do that the button will change to the word NEXT and you will hear the first audio instruction that will tell you to close your eyes. This is because these techniques are easiest to do with your eyes closed. The buttons are big enough that you can just keep your thumb (for smart phones) or the mouse cursor right over the button and keep clicking on it (or tapping) for the next instruction without having to open your eyes. If you don’t feel the energy by just thinking about the person, then you can use the LOCATE Technique to help you get access to the IN Technique energy that needs to be resolved. Start the LOCATE Technique that is the process for preparing to do the IN Technique. The LOCATE Technique for the IN Technique will guide you in finding where the IN Technique energy is being held in your body. As soon as you feel the IN Technique energy field shift to the IN Technique app and guide yourself through the resolution of the pain. When you have finished resolving the pain of the grief you can open your eyes. You just vaporized the stress has been the cause of your grief. You’ll notice if you think about the person again that the feeling of pain of loss will have been replaced by a kind of neutral feeling. It sort of becomes a non-issue. If for any reason the grief didn’t go away, you can get personalized help from a Certified Inner Greatness Coach by booking a session using the on line booking system at the bottom of this page. 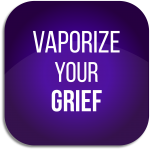 If you are having success with getting rid of your grief using the Vaporize Your Grief app then you will start to feel “normal” again. And if something happens in the future to trigger any remaining or new grief energy for any reason you can always use the app again to resolve it. If you try it on your own using the app and you still have any trouble with it, particularly if you are having trouble with either crying or doing something else to try to avoid having to feel the pain, you can get 1-on-1 personalized coaching through this process by booking a session with a Certified Inner Greatness Coach using online booking system at the bottom of this page. We do have many highly trained and Certified Inner Greatness Coaches who have already helped lots of people get over their grief. They are available for 1-on-1 sessions to help you. They have been doing this work already for many years and they are highly qualified to help via phone or Skype or similar. Click on this link for our directory of Certified Inner Greatness Coaches so you can select the coach of your choice. Please spread the word via your social media, email lists, any support groups or forums for people who are still grieving. Please let them know about these great free resources and help us to fulfill our mission of removing the pain of the world. Let’s create a world in which people get over their grief quickly and thoroughly so they can get on with enjoying their life. May you enjoy your life completely free of the pain of grief!